MBRRACE-UK has published the findings of the UK Perinatal Mortality Surveillance for 2013. The document is freely available online in its entirety and summaries and infographics are also available. Sadly, some members of the UK press have seen this report as another opportunity to attack normal birth and midwifery rather than address some of the key factors that are associated with stillbirth and neonatal deaths, which include social deprivation and ethnicity. Clearly, there is lots that can be learned from this kind of exercise. But it is complex, and needs careful consideration. 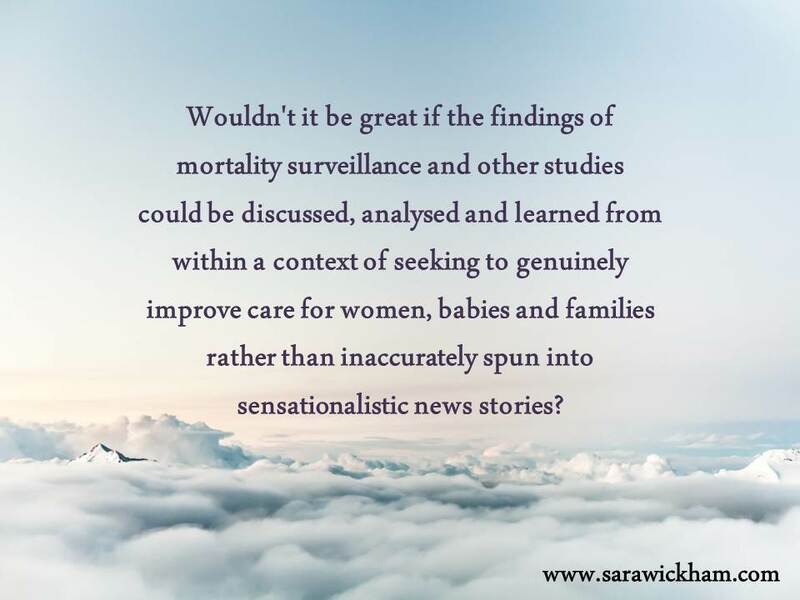 Wouldn’t it be great if the findings of mortality surveillance and other studies could be discussed, analysed and learned from within a context of seeking to genuinely improve care for women, babies and families rather than inaccurately spun into sensationalistic news stories? Manktelow BN, Smith LK, Evans TA et al on behalf of the MBRRACE-UK collaboration (2015). Perinatal Mortality Surveillance Report: UK Perinatal Deaths for births from January to December 2013. MBRRACE-UK: Leicester. ← Do we need to help VBAC dads explore their perceptions of risk?